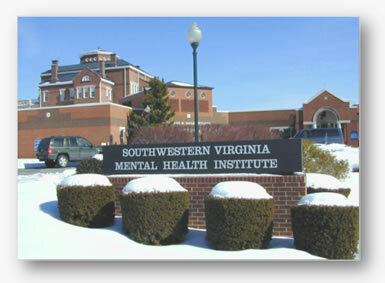 Southwestern Virginia Mental Health Institute (SWVMHI) is a 179-bed state psychiatric institute operated by the Department of Behavioral Health and Developmental Services (DBHDS). The Institute serves adult and geriatric individuals. SWVMHI's campus, located in rural Smyth County consists of over 40 maintained acres of land (approximately 100 acres total) with 24 buildings including its heating plant. Southwestern Virginia Mental Health Institute is accredited by The Joint Commission and is eligible to receive third-party payments, including Medicare, Medicaid, and Champus. As part of Virginia's public mental health system, SWVMHI serves adult and geriatric individuals from a number of cities and counties in southwestern Virginia. The SWVMHI catchment area is primarily rural in nature and has a total population of 564,000 people (2010 census figures). The primarily rural nature of the catchment area affects a number and variety of issues that impact the Institute. For example, this region generally has the highest unemployment rate in the state. In addition, outside the larger towns there is no public transportation, and it is difficult for the individuals to come to community clinics for treatment or rehabilitation. Also of note is the relative scarcity of private providers or private psychiatric hospital beds. The Adult Acute Treatment is a 71-bed, co-ed, Medicare Certified Intensive Psychiatric Treatment Program that provides acute assessment, crisis stabilization, and comprehensive treatment to individuals who are age 18 to 64. The unit utilizes a recovery orientation pursuant to the unique needs of the individual. Services are provided by a multi-disciplinary team with a focus to quickly improve the individual's condition for successful return to the community as soon as possible. Staff coordinate closely with community-based providers to ensure continuity of care following discharge. The 41-bed, co-ed, Geriatric Unit is comprised of a 20-bed Medicare Certified Intensive Psychiatric Treatment Program that provides acute assessment, stabilization, and comprehensive treatment, and a 20-bed Medicaid Certified Intermediate Treatment Program that provides psychiatric stabilization and comprehensive treatment on an extended basis. The Program admits individuals who are aged 65 and over as well as those individuals under 65 whose needs are congruent with nursing facility level of care. The program utilizes a multi-disciplinary team approach to provide expert diagnostic and treatment of psychiatric conditions of the elderly. Staff work closely with Medical Care Services to provide treatment for co-existing physical health conditions which frequently complicate psychiatric presentations with the elderly population. This 63-bed co-ed program provides services to individuals with severe and refractory mental illness complicated by behavioral disorders. The program emphasizes self management and self care skills specific to this population. Comprehensive psychiatric rehabilitative services guide the provision of treatment and recovery-based services. Physical and social activities are also used to stimulate interest in hope, recovery and enhanced self care. This service also provides treatment and rehabilitation for a number of forensic patients. The majority of facility NGRI (not guilty by reason of insanity) individuals are found on ERS wards. Due to the diversity of individuals who are admitted to SWVMHI, evaluation, treatment, and rehabilitation services are individualized, eclectic and reflect an approach which will best meet the treatment, rehabilitation, physical, spiritual, public safety/forensic, and enrichment needs of each client. We strive to enhance the individuals’ hope, motivation, and abilities so that they can function in their chosen environmental role. The treatment and rehabilitation programs, along with the unit environment at SWVMHI, have the goal to maximize the persons’ potential to assume responsibility for their own progress and recovery. Based on individualized assessments, including psychiatric, medical, nursing, psychological, psychosocial, dietary, and rehabilitation assessments, a treatment plan is developed and implemented to guide the recovery process. A variety of treatment modalities are utilized to facilitate the persons’ involvement; family, and/or significant others will be encouraged to participate in therapy whenever possible and appropriate.